The Vegetable Burger contains plenty of fresh vegetables, has a firm bite and, above all, a surprisingly great taste. An absolute winner within the product range. 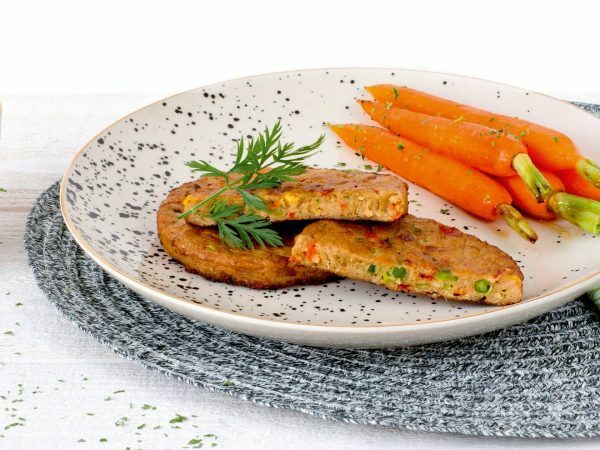 This vegetarian Vegetable Burger is available as a product weighing 85 grams, 100 grams or 15 grams. This small version of the Vegetable Burger is a delicious snack that can serve as an appetizer to go excellently with a hot meal or with gourmet dining. Vegetables 49% (onion, carrot, red sweet pepper, pea, corn, mushroom), water, vegetable proteins 16% (soy, wheat gluten, pea), egg white*, modified starch, flavouring (wheat, celery), sunflower oil, salt, milk protein (lactose), dextrose, palm fat, herbs and spices, starch (wheat, corn), soybeans, wheat, mineral (ferrous fumarate), vitamin B12. * free-range eggs. Produced in a facility that processes peanuts and nuts. Frying pan: 4-6 min. on a low fire. Turn every now and then. Oven:10 min. at 180°C. Turn once. Microwave: 1 min. at 900W.